I have the 5th generation 30GB iPod with video. It was given to me by the lovely Dana. Before the iPod I was using a Rio 500, and an iRiver IPF-180T. I had one annoying issue with syncing my iPod, but other than that, it’s been pretty much problem-free. 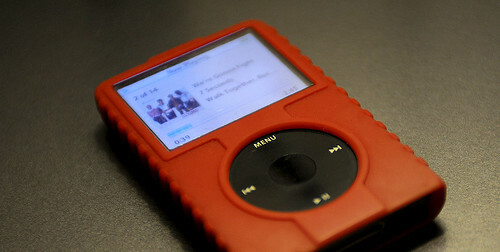 Now, in comparison, the Rio 500 still beats the iPod for bookmarking. The Rio has a button that will set a bookmark in any MP3 file. No so with the iPod. It does not support bookmarking of any audio file. This is annoying, especially as it was a feature I used daily, and had to give up on when I moved to the iPod. The iPod interface is simple, but I know at least one other person who has one that occasionally will not turn off, and has said “Couldn’t they just put a damn ON/OFF button on it?” Sometimes mine won’t turn off, so I just put it in my bag and hope it turns off automatically after a few minutes. In summary, I do love the iPod, but it’s not the ultimate player. It could use some improvements. I’m not sure Apple will ever improve it to my satisfaction, but I thought it was worth critiquing.